In a public event hosted by Parsons for the International Year of Light (IYL2015) and curated by Parsons professor and IES education columnist Nathalie Rozot, speakers will present project initiatives of public interest. The premise of this program is that lighting design is not a field known for socially-engaged work, and that the importance of quality lighting in the constructed environment in daytime and after hours is under-recognized. In a panel following the presentation, speakers will debate the role that socially engaged lighting design practices play and how lighting education can support a stronger social culture in practice and discourse in the field of lighting design. 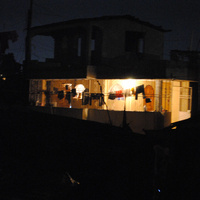 Presentations will include lighting projects in informal settlements in Haiti and in low-income housing environments, and examples of students’ work with underserved communities. Rozot is a longstanding advocate for more social activism in the lighting design professional and educational communities. She is actively involved in several initiatives, and she has presented and published her research and projects on social issues in lighting internationally. This is the first of two Parsons School of Constructed Environments events held at Parsons for the International Year of Light (IYL2015).